Allow me to introduce the LG 38UC99-W monitor to you, the monitor that has it all – a giant 38-inch curved screen with a subtle curvature, AMD FreeSync and 1ms Motion Blur Reduction technology, a vibrant image quality of its IPS panel, Bluetooth speakers, and a lot more awesome features. Although a bit pricey, this monitor delivers what it promises and lacks absolutely nothing but a higher refresh rate; alas, since the monitor is not primarily aimed at gamers anyway, it’s fair not to hold a medium refresh rate against it. However, thanks to its plethora of game-enhancing features, the LG 38UC99 display is actually a great gaming monitor. 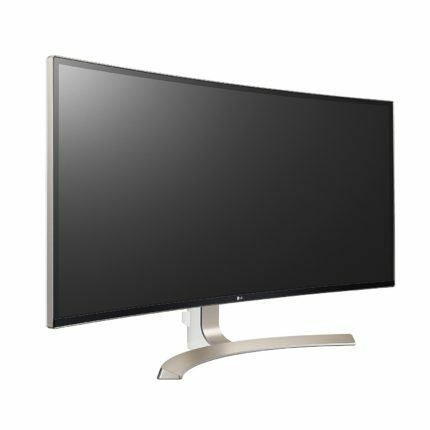 The display is also known by the name: LG 34UC99-W, which is the 34-inch version. The LG 38UC99 is an excellent monitor for the professional designers, photographers, and alike who don’t require a flat surface for their color-critical work; although the 2300mm curvature is rather subtle and provides a more comfortable but equally immersive viewing experience. The monitor is factory calibrated to over 99% sRGB (72% NTSC) color gamut and provides accurate, consistent, and uniform colors across the entire screen at all times. 10-bit color depth is supported with dithering (8-bit + FRC). LG’s AH-IPS panel also ensures the impeccable 178-degree viewing angles. The massive 38-inch screen at 3840×1600 resolution offers maximum detail due to the rich pixel density of 111 pixels per inch which is slightly more dense than 1440p on a 27-inch screen. We’ve encountered next-to-none backlight bleeding as it was only slightly visible at the edges of the screen on an entirely black background with no lights in the room. Although the contrast test resulted in a slightly lesser than 1,000:1 ratio, the picture quality delivers vivid colors and deep black tones, nonetheless. The response time of the LG 38UC99 IPS monitor has a few different speed levels that you can adjust in the OSD (On-Screen Display), including Fast, Normal, Slow, and Off. The fast mode offers 5ms response time speed gray to gray whereas in the off mode it amounts to around 14ms. The 1ms Motion Blur Reduction technology further increases the response time speed in order to more efficiently eliminate ghosting of the fast moving objects. Ghosting and trailing are noticeable in the fast-paced FPS games, but it’s much less evident and clearer thanks to the 1ms Motion Blur Reduction technology. However, ghosting is still not as imperceptible as it’s the case with the modern TN panel gaming monitors needed for the high-end professional gaming. In comparison to the other 4ms response time IPS panels, ghosting is a bit less prominent. Keep in mind that in order to enable the Motion Blur Reduction, you will have to set the monitor’s refresh rate to 75Hz as it doesn’t work at 60Hz. Additionally, you cannot have both FreeSync and Motion Blur Reduction active at the same time. Another interesting thing that’s important to mention is that if you’re using a Nvidia graphics card, you won’t be able to set the refresh rate to 75Hz, therefore neither to enable the Motion Blur Reduction technology. Freesync technology allows you to synchronize the frame rate of your FreeSync-compatible AMD graphics card to the refresh rate of the LG 38UC99 monitor. By doing so, you will gain a dynamic refresh rate within 52-75Hz range which will eliminate screen tearing and stuttering as well as reduce input lag. The input lag is the time the monitor takes to respond and display your commands and in this case amounts to around 11ms, which is very good. Although not particularly intended for gamers, the LG 38UC99 does offer plenty of gaming features apart from the mentioned technologies. One of such features is the Black Stabilization which increases the visibility in the dark scenes of video games by automatically brightening up the screen. There are also several pre-calibrated picture presets which have optimized parameters for different scenarios such as FPS and RTS as well as a customizable profile. Additionally, there are other well-optimized picture modes including Reader, Photo, Cinema, Dark Room, Color Weakness, and a Custom user-configurable mode. The reader mode incorporates the blue light filter which eliminates the harmful blue lights that cause eye fatigue after long working or playing hours. As the LG 38UC99 FreeSync display does not use PWM (Pulse Width Modulation), the screen is flicker-free and allows you to enjoy it for hours without straining your eyes. The navigation through the user-friendly OSD is easy and effortless thanks to the joystick that’s placed beneath the screen. Once you press the joystick, you open up a shortcut menu which offers quick access to input source selection, power off, Bluetooth connection, and the OSD settings menu. You can also adjust all the OSD settings via the On-Screen Display software which allows you to tweak all the features and parameters in a desktop application. The enormous screen space can be further utilized via the Screen Split 2.0 application which offers 14 different layouts of split screen as well as Picture in Picture and Picture by Picture modes. In addition, the Dual Controller feature simplifies the connection of multiple computers to one screen and multi-monitor setups. Lastly, the Screen Off option allows you to turn off the WLED backlight if you just wish to connect your mobile advice to the speakers and enjoy music. Other OSD settings include brightness, contrast, gamma, color temperature, RGB color levels, 6-axis color adjustment, etc. 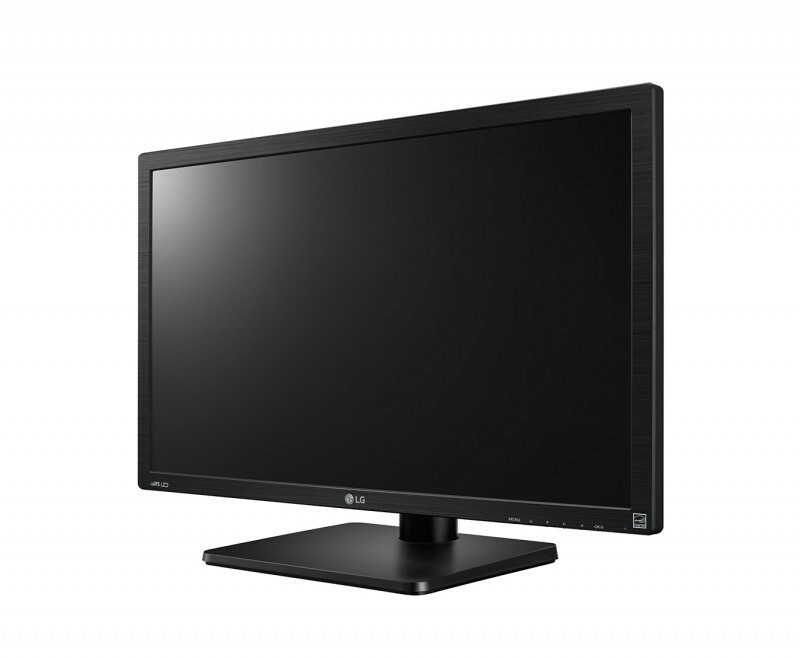 The slick design of the LG 38UC99-W monitor consists of a thin profile and narrow bezel appearance with silvery aluminum feel. The screen of the monitor isn’t edge-to-edge but rather has a 2.5mm silver frame and 9mm black border before the picture starts. The bezel itself is around 13mm thick which in combination with the black border still offers a cinematic viewing experience as the picture pops out. The steady base of the monitor has a matte silver aluminum finish while the rear side of the monitor features an unreflective glossy surface. The LG 38UC99-W screen is coated with a semi-glossy anti-glare protection which eliminates the sunlight reflection without adding grain to the image. Ergonomic functionalities include -5, 15 degrees of tilt, 110mm height adjustment, and 100 x 100 VESA mount compliance. The connector ports of the LG 38UC99 monitor include two HDMI 2.0, a DisplayPort 1.2, an USB type C, two USB 3.0 ports, one of which supports fast-charging capacity, and the headphones jack. The USB-C port allows you to simultaneously stream audio/video content, transfer files, and charge the connected device using only one cable. In the OSD settings, you can select the Bluetooth option which allows you to connect to a compatible device and stream music to the 2x10W built-in speakers with Rich Bass that covers sound under 85Hz with incredible bass depth. 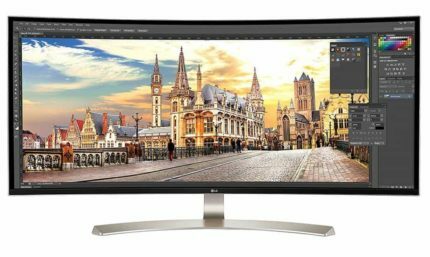 At the moment (May 2017), the LG 38UC99 display price amounts to $1,500. 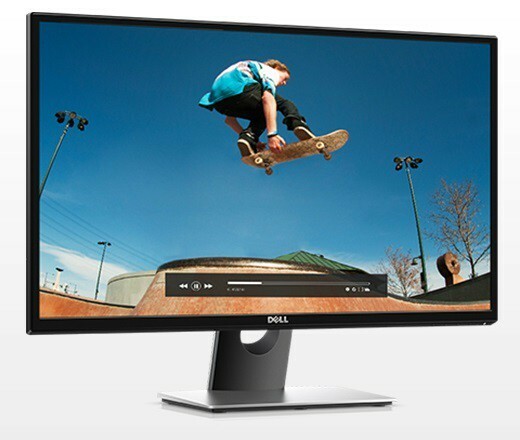 Surely, it isn’t cheap but after you consider its specifications, image quality, performance, connectivity options, design, and a plethora of exclusive features, it’s worth the money as there isn’t any other monitor that offers as much as this one. The LG 38UC99 is a giant and incredible ultra-wide monitor that delivers an unprecedented image quality and performance at such size. 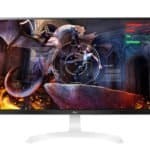 Add to that its sleek and thin-bezel design, extensive connectivity options, and numerous features for gaming, professional, and everyday use, and you get a pretty much ideal monitor. The response time may not be as quick as TN panel monitor’s speed of 1ms, but it provides an otherworldly immersive and smooth gaming experience in video games. If you’re looking for a monitor to bring life to your video games and movies and/or simplify your color-critical work with more workspace, plenty of features, and precise colors, the LG 38UC99 is the monitor for you that you’ll cherish for a long time. The LG 38UC99 is a giant monitor that delivers an immersive viewing experience due to vibrant colors and a stellar 3840×1600 ultra-wide resolution. Moreover, it provides you with an amazing performance with technologies such as FreeSync and Motion Blur Reduction. Lastly, the design is sleek and very thin for its size with extensive ergonomic and connectivity options. Just for info, you can set the refresh to 75Hz and use the 1ms Motion Reduction Technology with a nVidia card, works great with my 1080Ti. Also eliminates the frame skipping (that occurs without the Motion Tech enabled).